Last week, during our laboratory meeting, we worked to develop a laboratory mission statement. My real inspiration for this came from my friend and colleague Elena Bennett – she also got me connected to Jessica Hellmann’s excellent post on the topic. A mission statement is really just a way to clearly define who we are, what we do, and why we do the sorts of things that we do. From a research laboratory’s point of view, the goal of the exercise is (in part) to help all members of the laboratory feel part of something bigger. Something that has broad relevance to a community that extends far beyond the walls of our institution, and far beyond the boundaries of our own specific research projects. As Jessica states clearly in her post, a Mission Statement “…is a description of the purpose for your organization, primarily as it now is and/or will be within the next few years. A good mission statement should accurately explain why your organization exists and what it hopes to achieve in the near future. It articulates the organization’s essential nature, its values, and its work. The statement should resonate with the people working in and for the organization, as well as with the different constituencies that the organization hopes to affect. It must express the organization’s purpose in a way that inspires commitment, innovation, and courage.”. A mission statement should be short, easily remembered, jargon-free, proactive, and readable to people outside of our organization. 2) We mixed up these cards and each person took someone else’s card. We then went around the table and read what was on the cards. This allowed us a terrific jumping off point for the discussion and generated the necessary words and ideas. 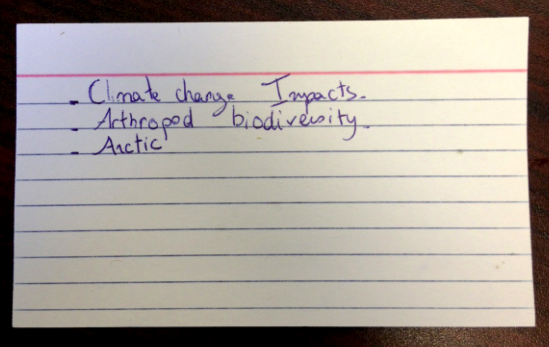 3) The ‘scribe’ (in this case, it was me) wrote down each descriptive word (in our case, things like ‘arthropods‘, ‘human disturbance‘, ‘biodiversity‘ came up a lot), and as a group, we wrote down some verbs to help us think about the ‘action’ that we take with the things we do. Here, verbs like ‘explore‘, ‘quantify‘, ‘share’ came up a lot. 4) We wrote the mission statement – in two parts. (a) We tried to provide a few sentence of context, and to ground our laboratory in the ‘why‘ and the ‘what‘; (b) We wrote a few sentence of ‘how‘ we do our research. How did we do? We would love your feedback on this. This was a very worthwhile process – it was an amazing discussion and gave as opportunity to really delve into areas that were well beyond our individual research interests. I have always believed that ‘patterns in terrestrial arthropod biodiversity’ was really what I spend my research time thinking about; it’s good that the collaborative process of developing a mission statement ended up reflecting that! Any specific habitat (e.g., canopy systems, the Arctic), or even any type of arthropod (e.g., beetles, spiders) never remained in our final mission statement. This is terrific, and shows well that the laboratory has diverse interests, but more importantly, that we encourage research in different places and with different model taxa. Yes, jargon remains. This is difficult. We agreed, as a laboratory, that our mission statement would be aimed at a ‘scientifically literate’ audience. I’m an ecologists and we do ecology, yet that word did not end up in the final product. Curious. We ALL agreed about the importance of ‘sharing’ and engagement with a broader audience -many of us do various kinds of outreach, from blogs and tweets to volunteering to talk about insects in local elementary schools. I was extremely pleased and proud that our laboratory sees this is a core activity. This process if far from over: the next step is a “Vision Statement“. As Jessica points out, a Mission statement is more about what we “do” and why, whereas a Vision Statement “...looks at least five years into the future and defines a future state. It is an articulation of a world that the organization and people are working toward, not what is expected to happen now“. Ok, that’s a task for a future lab meeting! Excellent mission statement and also sums up very effectively what my lab is all about too! Very cool Chris. What do you think the shelf-life of a lab mission statement like this is? Do you think you’ll need to revisit & reassess every 3 years? 5 years? 10 years? Also, do you think the mission statement will evolve with future funding cycles & successes, or do you think your funding cycles & successes will evolve around the mission statement? Thanks Morgan – you ask a good question. I think the mission statement is probably pretty solid for 3-5 years, in part b/c of funding cycles, but also b/c of more subtle changes in the discipline. Fundamentally, yes, I think it will evolve (and should). I think it would be important to revisit it annual, and see if it still makes sense. When we get around to writing a ‘vision statement’ it’ll be more forward-looking and provide clear goals and objectives – the shelf-life of a vision statement will be better understood, I think.